WHAT’S HAPPENED TO NORTH STREET? All that is North Street today, taken from Cheapside. North Street. dominated by the Telephone exchange ,on one side and the Civic Centre on the other – is not really a street any more since the ring road came and cut it in half. 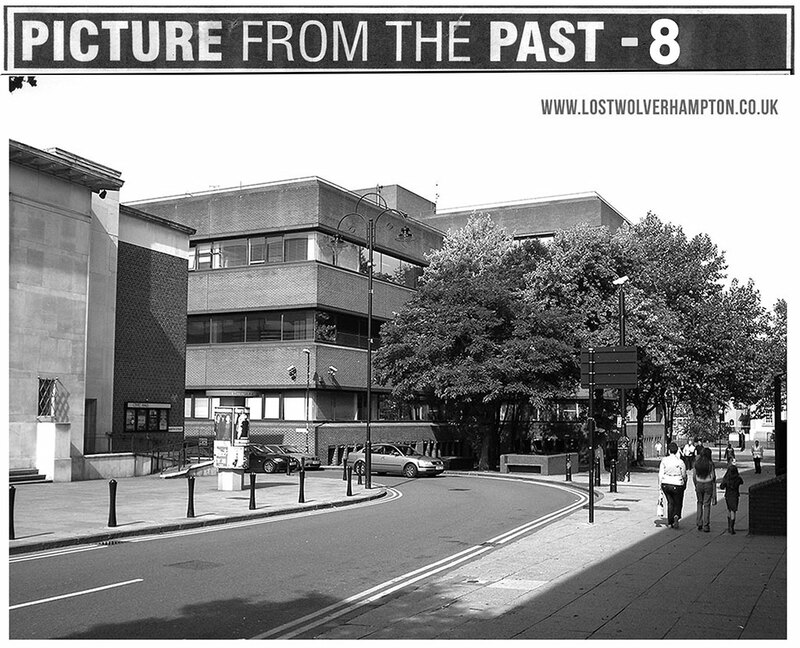 Today in 2015, with Wadhams Hill gone, The Town Hall, Civic Hall , and Giffard House, are now isolated and parted from the Molineux Hotel, a former Georgian house of similar character. The soul and spirit has been lost forever from the North Street I remember. 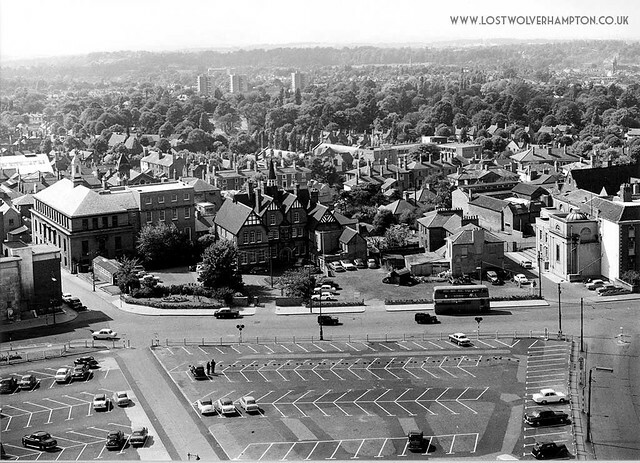 As you can see apart from Giffard House and chapel, and the adjacent Molineux House the North side of the town then was mainly gardens and nurseries. As its name suggested this street was once the principal route to the North from Wolverhampton. I have this framed oil painting of the 200 yards of terraced housing shown in blue on Taylors map to give an idea of the type of housing in North Street at that time. It shows the start of Dunster Lane (Molineux Street) on the left and the run of housing on the right from Tin Shop Yard to The Londes. The little black water, pump stands close to the original “Feathers” Public House. This small terrace block and the area behind it once called “Fender Row” will be pulled down in 1913. 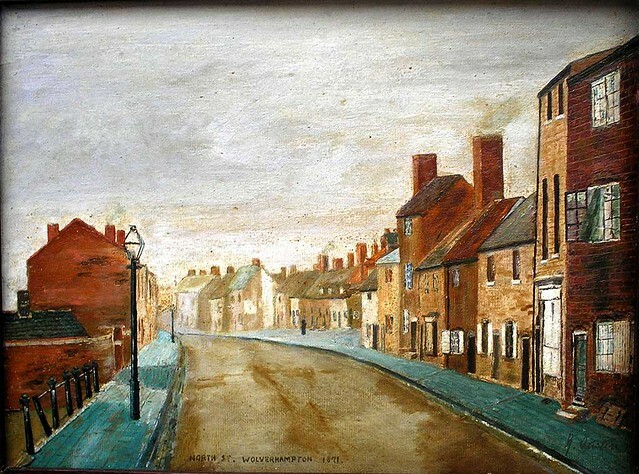 The “Feathers” public house will be re-built, But apart from a Large Air Raid shelter and Water Tank built at the start of the 2nd World War this peice of North Street will lay derelict and undisturbed until the University begins its encroachment in the 1960’s. BUT WHAT ABOUT MY NORTH STREET? If you imagine the centre of Wolverhampton as a round rich fruit cake, for me this was the slice with the cherry on top. St Peter’s – bordered by North street, Stafford Street and Queen Square pictured at its best here in 1935 , so full of life and energy. Well I was born here in 1937 and the picture I see is different from the one my father saw, born there in 1906, and the one my Grand mother would remember born in that same street, in 1884. In my day It ran from Queen Square for roughly three quarters of a mile, and at a time between the wars, besides the majestic Town Hall and the complimentary Market Hall, opposite. 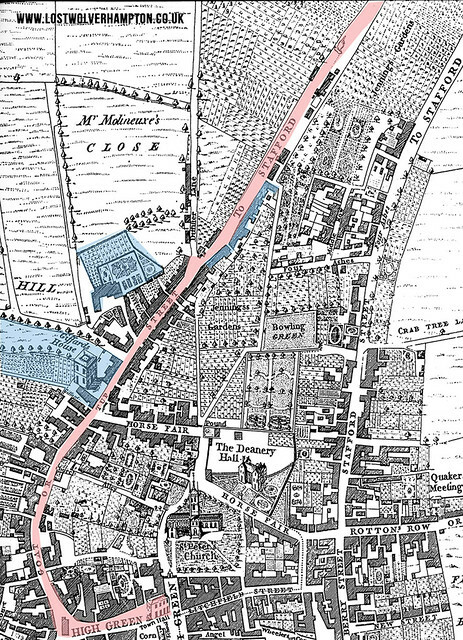 It contained the fine Georgian residences, of Giffard House and Molineux House and then on both sides of this wide causeway stood every type of trade and business you could mention, plus two Churches, two Schools, and ten Public houses , and many terraced houses finally reaching pub, number ten the ‘Gladstone’on the Corner of Red Cross Street. The last half mile known as North Road, carried on again passing many other shops, fine Victorian Terraced housing,and mansions including a home for unmarried mothers, a Working Mans Club, and two more pubs until it reached the five ways. at the junction of Waterloo Road, Stafford Street , Dunstall Road, and Fox’s Lane to become the continuing Stafford Road. It is hard to imagine that on that north side of St Peters, pictured at the top half of this scene today in 2015, apart from The old Polytechnic (University) in Wulfruna Street, Giffard House in North Street and over to the right in Stafford Street Attwoods Garage,(today the Kwick-fit) Everything else has been bulldozed to be replaced by the Ring Road, the forever extending University buildings, and the Molineux F.C. Instantly recognisable today here on picture 1, are The Town Hall, The Civic Hall and the large dome of the Darlington Street Chapel, still open for services as its been for over a century. But immediately beyond these buildings in North Street, and Waterloo Road, a considerable clear out has since taken place with the development of the ring road. St Mark’s Church is still standing with its wonderful spire in the middle background although now deconsecrated and used for offices. 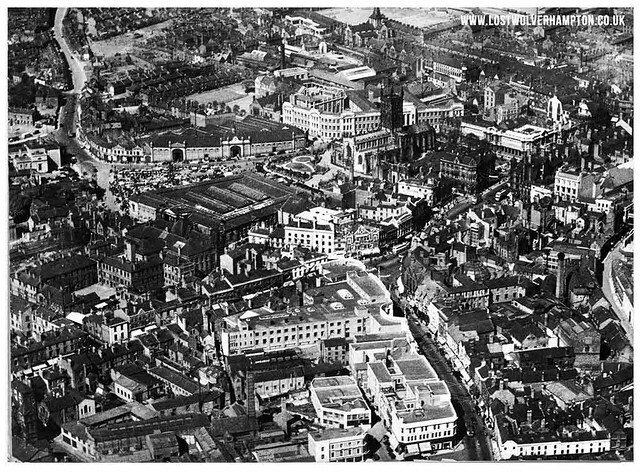 In the left bottom corner of the picture is old Cheapside. The “Queen’s” Public house still stands on the corner although altered and renamed now, it has occupied that same site for over a century. Not so the Times Furnishings next door it was re-built on the site of the Hippodrome Theatre on its unfortunate end through fire in 1956, Yates Wine Lodge now occupies this site. Let me describe Picture 2. On the left of Mitre Fold is the Civic Hall whilst on the opposite side of the fold fronting the Telephone Exchange , is the portable building housing the Citizens Advice Bureau. To the right of it, is the majestic former Bluecoat Schools opened in 1888.School children of the 1950’s will always refer to it as the Education Offices (Clinic). Leaving from its terminus outside the Education Offices and is heading down North Street , past Paternoster Row and SS Peter and Paul’s Church is the Brewood Bus and this scene is set in front of the wonderful backdrop of the West Park. Now picture 3 is a personal delight for me , it shows the church were my father and mother were married in 1936, the Nursing home where I was born in 1937, and a few hundred yards away down North Street, was the house we lived in for forty years. Then dominating the backgound, the large Chimney Stacks known locally as The Three Sisters factory where my father found employment for most of his working life.- Courtaulds. 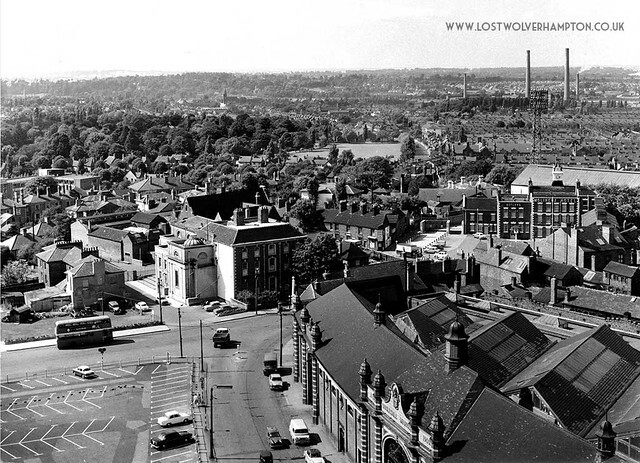 In the right foreground – The Molineux Hotel – were my mother started her first job as a nanny in 1926, and finally the Wholesale Market where I started work when leaving school in 1952. Looking down here again from the old church roof of St Peters you see immediately in front on the left the temporary car-park laid out on the site of the recently removed market patch – soon to become the site for the Civic Centre, then across Wulfruna Street on the right stands the striking red brick and terracotta building of the Wholesale Market. At the side of the trees in the garden on the right of Giffard House A removal van is parked at the top of Wadham’s Hill and Molineux Alley, this alley ran down the side of Molineux grounds across Waterloo road down to Whitmore Reans. 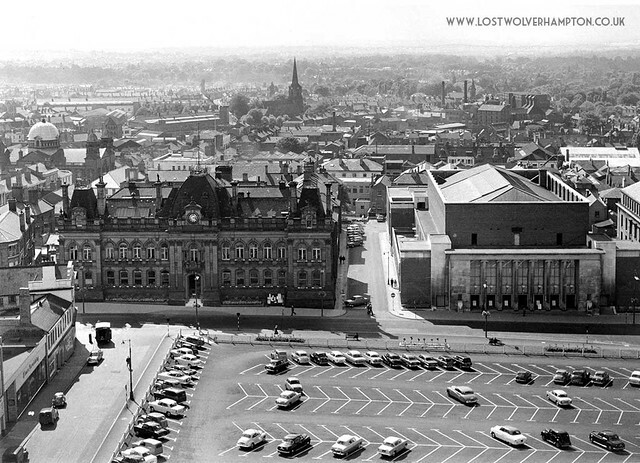 Now looking over the top of the roof of the Wholesale Market, and Walters Lock factory in North Street here in 1968 you see the once magnificent Molineux House – Hotel, steeped in history. and looking over the top of the hotel, across the South Bank and the Molineux Grounds, reaching for the sky just beyond the many roof tops of Whitmore Reans, are the four large chimney stacks of Courtaulds Dunstall Textile Works shortly to become redundant – as will the Wholesale Market – in the early 70’s. Finally to the left of Whitmore Reans, across the top of the Municipal Grammar School and Newhampton Road is the West Park. Now as sterile as these scenes appeared in the late 1960’s Although I don’t like change, I could have gone along with these changes. But as we all know today our town gets continually spoiled by progress. I am sure many will agree the Soul and Spirit, has gone from our 1940’s-50’s playground today.